January, although the days are short and, at least in California, winter chills the air, is a month of light and promise, a curious turn around time. There is the promise of spring, of course. We are past the winter solstice and we know the days are lengthening and growing warmer. January also brings us the New Year, and whether we make resolutions or not, there is a sense that we could if we chose to, we could change our ways if we desired to, we could repent and move in a new-year-direction. So January offers us hope that we and our world can be better. And so does the Church Year, with January festivals that enlighten the already hopeful, promising month. Epiphany lives in these weeks and days, recalling wise men who follow a bright star to a child king born in a manger. We too can follow the star, we are told. We too can kneel before the Son of God born of woman, the God of all creation who took our flesh upon him. We can, if we choose. Epiphanytide lasts two-to-six Sundays. It is a flexible season, moving with the date of Easter. When Easter is early, as it is this year (April 5) Epiphanytide shrinks. When Easter is late, it expands. So this year there are only three Epiphanytide Sundays, three celebrations of the manifestation of God’s love through his son to the world. Epiphanytide’s Scriptures reflect great moments of change, moments of illumination, moments of vision that might effect our own change. They are meant to enlighten us, show us who the baby born in the manger was and is. We hear about Jesus as a boy in the Temple of Jerusalem, when he identifies himself as the Son of God. We hear the account of Jesus’ baptism when God identifies him as his beloved son. We hear about the changing of the water to wine in Cana, the first recorded miracle Jesus performs, identifying him as divine. January moments, Epiphany moments, of light, of illumination. But sometimes light can be be blinding. How appropriate, I thought, that today we celebrated the Conversion of St. Paul as well, since January 25 lands on Epiphany 3. 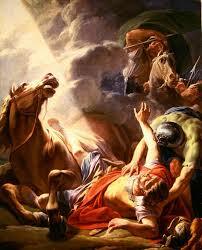 The story of St. Paul’s conversion has entered our literature and lexicon, a powerful image in Christendom. We speak of a Damascus moment, or a Road to Damascus experience and understand we are talking about a blinding, sudden illumination, a 180-degree turn. I hadn’t noticed before that this festival often lands in Epiphanytide. I’m sure it’s by design, for the Conversion of St. Paul is a perfect distillation, essence, of Epiphany, as though all of the manifestations we talk and read about are pulled into that sudden single blinding flash of light, light holding the voice of God. The greatest witness of truth is action, a true about-face, a reversal in one’s calling and one’s life. Conversion. Saul is converted from persecutor to preacher, and in a highly public and dangerous forum. Saul knew this Jesus had been crucified. He was dead. He was buried. How could this Jesus now blind him with this light that appeared to be one with him? How could he be alive; how could he speak to Saul from the heavens? And to Saul of all people who was the least likely to believe the vision, knowing all too well the cost of such belief? And yet Saul does believe, he changes course, turns around. He even changes his name from Saul to Paul, and becomes in time the greatest theologian in the Christian world, melding Platonic ideas with Jewish and Christian theology. Paul explained the Gospel to the rest of us. He, like the wise men, manifested Christ to the world. January too is Right-to-Life month, a time when our nation is called to repent and change. As I read about the many who marched through their cities and towns this weekend, I thought of that road to Damascus. I prayed that our culture would have such a blinding epiphany, a Damascus moment, that our nation would see that this is not who we are, that we are not a culture of death, that we do not kill our children. With each year, as another generation is lost to abortion, the protesting crowds grow in number. With each year, more help is offered to those with unplanned pregnancies, as networks of support crisscross our land. I have found that the Christian life is dramatic and adventurous, a life of millions of epiphanies, moments of light. Sometimes the light of God shines on my own heart, revealing my sins, a painful illumination but a necessary one. Only in the blinding glare of such Damascus light can I truly see. So we are always repenting, changing, moving toward God, catching, reflecting, refracting light from him like facets of a shining jewel or brilliant star. As January 2015 comes to an end, light lengthens and we see ourselves as we are. We travel the road to Damascus. We are ever repenting, turning around, yet ever sure of our destination. We travel into February, into penitence, into preparation for Lent’s lengthening and illuminating light. We look to the life of Easter, for we are on the road to resurrection. This entry was posted in Uncategorized and tagged abortion, Christ, Conversion, Damascus, Epiphany, illumination, January, light, right to life, St. Paul. Bookmark the permalink.